Structural steelwork has played a central role in the construction of Rochdale’s new council building, a project expected to kickstart a large scale town centre renaissance. There is little doubt that the economic downturn is affecting the health and viability of town centres across the country, but a large scale redevelopment currently taking place in Rochdale aims to buck this trend. The local authority is spearheading an ambitious £250M programme to create a vibrant town centre with new leisure, shopping, cultural and learning opportunities for residents, visitors and businesses. Work is currently under way to bring the Metrolink – Greater Manchester’s light rail system – to the town, and a new leisure centre is taking shape, but currently dominating the town centre is the construction of the new library, customer information point and council offices building. Due to be completed by the end of the year, the new facility will bring together around 2,000 council staff from more than 30 buildings. The council says this will save it more than £28M in maintenance costs. To be known as Number One Riverside, the 1,532m² building will meet high energy saving standards with features such as solar thermal panels, which use the sun’s rays to generate hot water, and photovoltaic panels creating renewable electricity. Other installed features will include a biomass boiler to generate sustainable heat, while rainwater will be harvested and recycled. The building is essentially a five-storey concrete framed structure with two S-shaped wings separated by an atrium. Spanning the atrium at roof level and supporting glazing and high level rooflights is a steel-framed structure. Topping the building, steelwork forms the project’s feature element, chosen for this part of the job for a number of reasons. The atrium roof follows the S-shape of the building and is approximately 100m long. A series of steel moment frames, arranged in goal post configuration, were installed to construct the roof. The trusses (frames) are made of box sections and are between 8m and 11m wide, and 1.2m high, supporting a glazed facade on the sides and louvre panels and rooflights along the top. 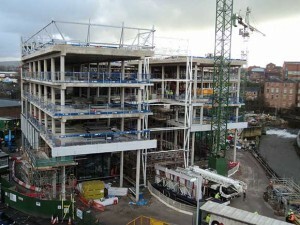 The roof steelwork trusses sit on the top of the concrete structure on either side of the atrium. Holding bolts, supplied by Caunton Engineering, were cast into the concrete prior to the trusses being erected – an example of the integral coordination between trades needed on this project. On the northern elevation of the building the atrium forms the structure’s main entrance and here two lattice trusses positioned on either side of the void support the glazed facade. The trusses are 25m high – the full height of the building – and 1.5m wide. 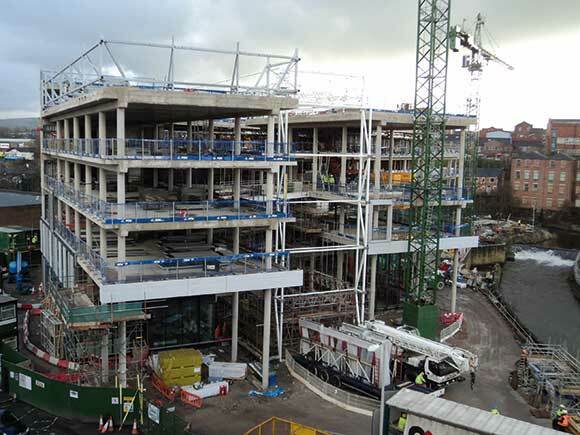 Using only the project’s tower crane, the steelwork erection programme for the atrium commenced with the north entrance and progressed ‘frame by frame’ along the roof towards the southern elevation, a method that ensured overall stability was maintained. Each of the wing’s floorplates differ, with some spanning the atrium in places, and others not. Eleven steel footbridges, varying in length up to 17m long, are located on the first, second, third and fourth floors and also span the atrium linking the two wings. 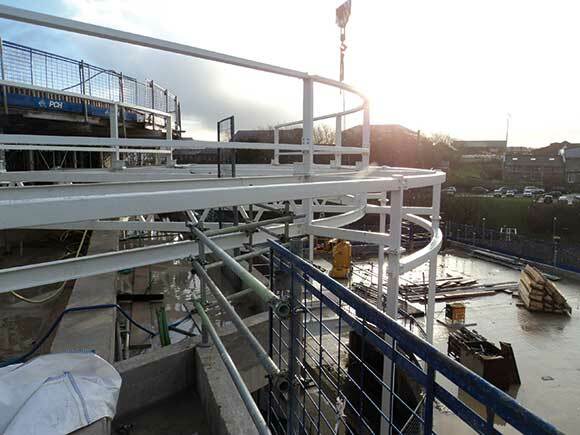 Steelwork contractor Caunton Engineering fabricated, supplied and also erected the ten footbridges as complete units, with two of them erected in conjunction with a vertical concrete column passing through the middle. Each of these bridges arrived on site with metal decking in place and handrails fixed, allowing them to be erected directly from the delivery truck. An eleventh footbridge, the longest, had to be erected ‘piece small’ as its weight exceeded the tower crane’s capacity. 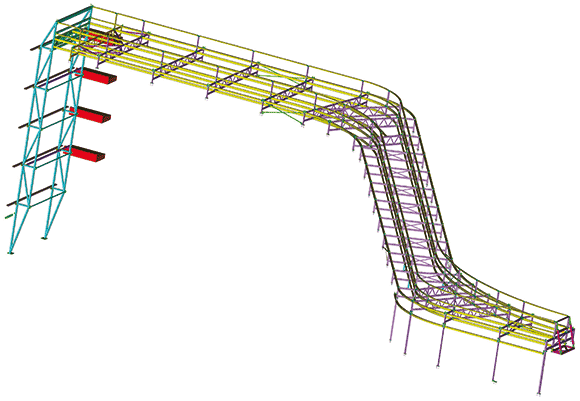 Coordination between trades was a key issue for this job, not just for the positioning of the atrium roof’s holding bolts, but also the erection of the eleven atrium footbridges. These steel structures, all fabricated, supplied and erected by Caunton, vary in length from 7m up to a maximum of 18m. The bridges are positioned at various locations along the atrium’s length, with three on the first floor. three on the second floor, three on the third floor and two on the fourth level. In order to aid a quick and efficient construction programme the bridges had to be erected along with the concrete superstructure. As each floor was constructed, the bridges for that level were ready and lifted into position. Thanks to off-site fabrication, the erection process was quick and performed by one solitary mobile crane.